Being involved in a car crash can be devastating. Your doctor may tell you to relax and focus on healing, but that’s hard to do when you’re juggling phone calls from insurance claims adjusters, your employer, and keeping track of your mounting medical bills. A personal injury lawyer can make the weeks and months following your car accident easier to navigate. Personal injury settlements provide compensation for medical bills and lost wages, as well as the intangible losses you suffered as a result, such as physical pain and suffering, mental pain and suffering, loss of enjoyment of life, and inconvenience. 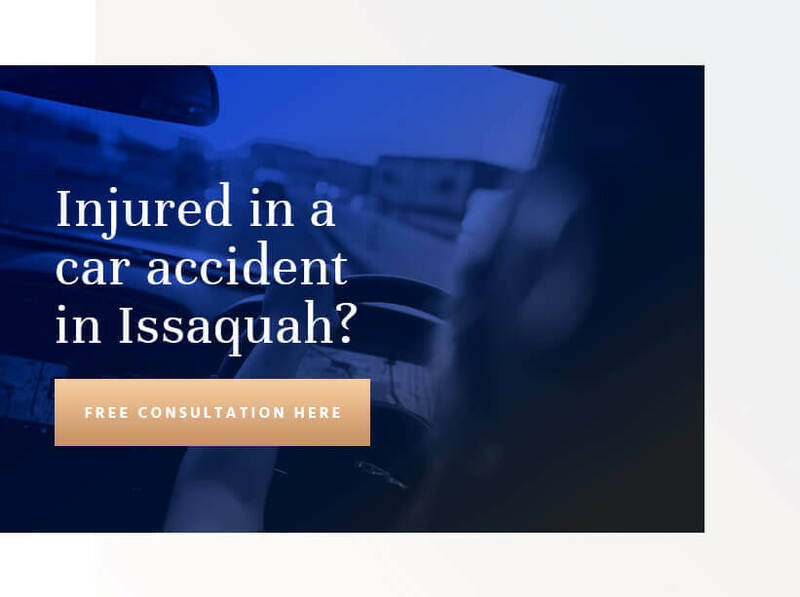 An experienced Issaquah car crash attorney can help you navigate the legal matters surrounding your wreck, while fighting for the compensation you deserve. Motor vehicle crashes are one of the leading causes of death and injury in the United States, and Washington is no exception. In fact, there is a car crash every 5 minutes somewhere in the state. The average traffic congestion around Issaquah increases every year, according to the Seattle Department of Transportation. In fact, it’s up 2.4% since 2013. Traffic congestion plays a direct role in car accidents in downtown Issaquah, the Issaquah Highlands, and Sammamish. Traffic congestion affects more than just the highways – it’s increasingly becoming an issue on Front Street and historic downtown. Though many have proposed a bypass, King County lacks the funds to aid the city. Some of the busiest roads in the area are also those most frequently reporting accidents. Examples include I-90, Lake Sammamish Parkway, and Washington State Route 900. Some of the most common contributing factors to car accidents in the area, are failing to yield the right-of-way, and failure to assure a safe stopping distance. File a police report if you haven’t already. Police reports often contain vital information regarding an accident, including a designation of fault. This could aid your insurance claim or an additional personal injury claim. Don’t sign any paperwork unless advised by an attorney. Your insurance company and the other driver’s insurance company may present you with an offer or other paperwork; we highly recommend having an attorney committed to your best interests review it first. Hire a personal injury attorney. A car crash can have devastating consequences – some may even lead to a lifetime of hardship. A personal injury attorney, with experience in local car accident law, can help you gain compensation for your injuries and give you the tools to live your best possible life. If you believe you have grounds for a personal injury claim, your first step is to contact Colburn Law for a free initial consultation. Let us help you on the road to health and financial recovery – contact us to schedule your case review today.